A long-forgotten battle over a set of row houses in South Philadelphia makes current day NIMBYism look tame. What can housing advocates learn from how they finally got built anyway? On the night of July 5, 1971, residents of the Whitman neighborhood in South Philadelphia embarked on a campaign of systemic vandalism. A crowd of several hundred people marched on a vast vacant lot in the southeastern corner of the neighborhood. 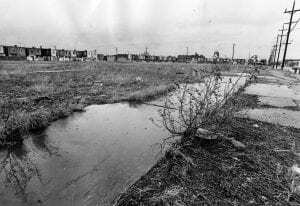 The muddy tract, strewn with rubble and construction equipment, covered several city blocks. It was surrounded by a 6-foot-high plywood fence. The lot was a definite eyesore, but the residents considered it preferable to the project slated for the space: 120 units of public housing in a project named Whitman Park. More than 80 percent of the neighborhood’s residents owned their homes. Their values might not have been appreciating, but they weren’t declining either. In many cases, those little row houses were all Whitman’s working-class residents had in terms of assets. In that context, bringing public housing to their corner of the city seemed an existential threat. And they were going to do something about it. Two contingents of police were dispatched to protect the construction site that night, but they arrived too late and, in any case, did not leave their vehicles. That decision was prudent for both the physical health of the police—a June memo from the commissioner warned that confronting the protesters would result in a “blood bath”—and the political health of their superiors. 1971 was an election year in which the city’s Democratic Party was trying to win back the row house white vote from Richard Nixon and his law-and-order Republican progeny. But 10 years after the neighborhood attacked the fence, and 25 years after the integrationist project was conceived, the housing was built. Today the long, nasty fight is largely forgotten except by those old enough to have witnessed it. Philadelphia is still one of the most segregated cities in one of the most segregated regions in the nation. In the 1950s, housing reformers and good government liberals tried to advance integration in the region with a plan to build 21 new public housing projects in predominantly white communities for those on the long waitlist—who were already 90 percent black by 1957. The effort failed spectacularly in the face of vehement opposition. The eventual construction of Whitman Park was its only and much belated, victory, won not by politicians or bureaucrats but by a concerted activist campaign and a lawsuit that marked the first successful use of the disparate impact legal theory. Today the region’s subsidized affordable housing stock remains as segregated as ever, with most remaining public housing complexes located in low-income African-American neighborhoods. Many of the Housing Choice (Section 8) vouchers and Low-Income Housing Tax Credit–financed housing are also based in these neighborhoods. Recent attempts to equitably share the responsibility for voucher-holding households have failed amid internecine conflicts between local bureaucracies. In this context, the battle over public housing in Whitman Park is worth remembering as one of the Philadelphia region’s only successful attempts to bring racially integrated subsidized housing to a predominantly white neighborhood. The housing authority’s original plans for the site, however, would have established an entirely different black presence in the neighborhood. In 1950 the Census tract only contained 402 African-Americans out of a total population of 17,703. Initially the Whitman public housing was meant to be a cluster of high rises for families, containing 260 apartments, dubbed the Delaware Towers. Whitman residents said that such a design would be profoundly alien to a neighborhood of two-story brick row houses, prompting the housing authority to develop a compromise. They reduced the number of units to 120 row houses, chiefly distinguished from their neighbors by small driveways (a valuable amenity in a parking-scarce neighborhood built out before automobile ownership was the norm). The housing authority went even further in its quest to quell neighborhood opposition, altering the very nature of the project. Instead of traditional public housing, the Whitman homes would be operated under the federal “Turnkey III” program. This meant tenants could, after a set period of years, purchase their homes from the housing authority and thus remove them from affordability restrictions and government subsidies. The substantial fruits of polite resistance were already manifest, but they would not be nearly enough to satisfy the homeowners of Whitman. In most American cities, public housing constructed in the 1930s–50s was almost always segregated by race both in terms of tenancy and neighborhood placement. But by the 1960s, with the civil rights movement in ascendance, pressure for integration began to mount. Many housing advocates sought to scatter public housing throughout stable working-class and middle-class white communities that wouldn’t be tipped into poverty by the presence of a few hundred low-income families, who could in turn benefit from safer streets and better amenities. Liberal mayors like New York’s John Lindsay took up the cause, not realizing the depth of the resentment such a project would engender in neighborhoods like Queens’ Jewish-dominated Forest Hills. In Philadelphia, the ordeal began in the 1950s, when liberal reformer Richardson Dilworth began the process that would eventually result in Whitman Park, if precious little else. In Washington, D.C., the administration of Richard Nixon was divided on the issue as well, with HUD secretary George Romney advocating for integration despite the political dividends his president saw within the white backlash. The Philadelphia Housing Authority learned their concessions hadn’t bought peace in late March of 1971, when a group of 30 women, some towing children, entered the construction site and sat down to obstruct the bulldozers. These direct action protests began occurring every day, accompanied by near constant picketing. 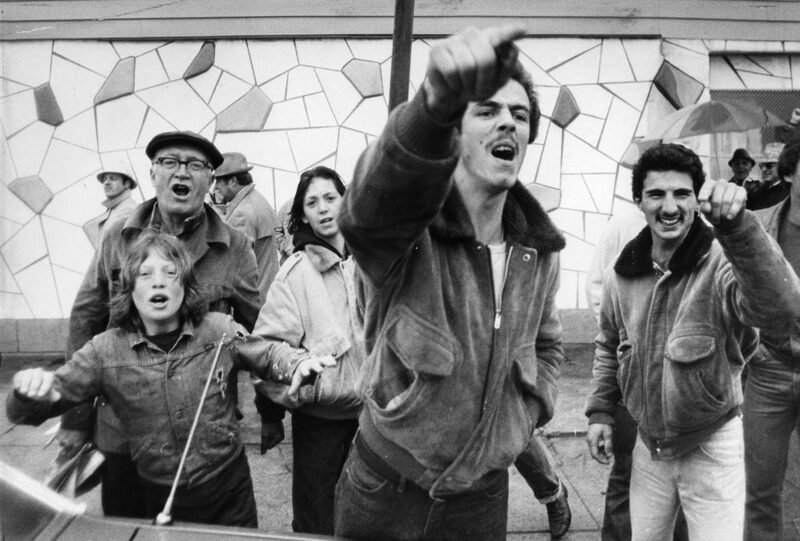 Many Whitman Park residents had unionized jobs as stevedores at the nearby Navy Yard or in the building trades, so the protestors appealed to class solidarity with the unionized construction workers. Picket signs read, “Will organized labor encourage socialism or defend democracy?” and “Honor Our Pickets, You Pay Taxe$ Also, No Public Housing.” When construction equipment or delivery trucks approached the site, a warning system was established to rally nearby residents who happened to be home, usually women and children, who would rush out to block access to the site. Sound trucks would roll through the neighborhood to call people to the picket lines or to community meetings. Although the Whitman Council and its president, Fred Druding, eschewed racist language or appeals to violence, ominous rumblings were heard at many public meetings. “If public housing is built, we will blow it up,” a neighborhood resident said at a mass meeting, according to a police report. Another cop heard, “We don’t want no n****** in our neighborhood.” Vandalism continued. The contractor, Multicon, sought an injunction against the sit-ins and constant picketing. But the protests only grew in size and fury and Democratic Mayor Jim Tate, already worried about working-class whites defecting to Nixon’s Republican Party, temporarily ceased construction. “The potential for violence to erupt in the Whitman Park area in South Philadelphia if construction resumes on the low-income housing being developed in that area is an almost certain fact,” wrote police commissioner Joseph O’Neill on June 7, estimating that a detachment of 800 police officers would be needed in the event of a riot. Instead former police commissioner Frank Rizzo got to be the next mayor, Multicon got $3.5 million in damages when he killed the project, and the city got hit with a landmark civil rights lawsuit. The city’s leading Democrats ran Rizzo because they feared losing the white row house vote, which had been breaking for Republican candidates. The former police commissioner could win them back with his tough guy tactics (he told one newspaper during the election that the Black Panthers “should be strung up. I mean, legally”). Throughout his campaign, Rizzo promised to shut down the Whitman project if elected, and to never allow public housing in any neighborhood that didn’t want it. When Multicon tried to resume construction in 1972, he took them to court. When the Philadelphia-area HUD director tried to intervene, Rizzo got in touch with the Nixon White House and the HUD director got a call from the D.C. agency’s general counsel with orders to keep a “low profile.” With no help forthcoming from the feds, Multicon left the project with $3.5 million (inflation-adjusted) in city money as consolation. A nascent civil legal aid organization, Community Legal Services, decided to go after Rizzo and the city over the disparate impact Whitman Park’s cancellation would have on Philadelphia’s African-American population. Young lawyers George Gould and Jonathan Stein represented the Resident Advisory Board (RAB), a scrappy public housing tenant organization that quickly began protest actions of its own when the Whitman residents began obstructing the construction of Whitman Park. The long trial brought the interference of Nixon’s HUD to light. It also included testimony from the former head of the housing authority, who swore that Rizzo told him that the tenants of public housing were almost all black and that white neighborhoods shouldn’t be forced to accept such developments against their will. Tensions ran high. Gould and Stein tried to prove that Rizzo’s actions were motivated by an animus toward black people and that his policies would disproportionately harm them. And with an almost entirely black waiting list in one of the most segregated cities in the nation, their case was strong. But the 1968 Fair Housing Act’s disparate impact standard was as yet untested before a circuit court, and the judge presiding over the case, Raymond Broderick, was a Nixon appointee as well as the 1970 Republican candidate for governor of Pennsylvania. Nevertheless, in 1976, Broderick ruled in favor of RAB, found that Rizzo and the city had acted with discriminatory intent, and in the process established judicial acceptance of the Fair Housing Law’s disparate impact test. When the Supreme Court upheld the disparate impact standard in a 5-4 vote last summer, they cited RAB v. Rizzo. This time, however, there was a mass protest movement to counter the influence of the anti-housing activists. The mostly female membership of RAB had been fighting for Whitman Park since 1971, but by the late 1970s the city’s ascendant black political class took up the cause. The women and, later, their lawyers made the wise tactical choice to make the fight about Rizzo, instead of just abstract issues like segregation and public housing. Figures from across the spectrum joined the chorus in favor of Whitman Park, from Charles Bowser, who had served in the previous mayoral administration, to the fiery Milton Street, who led marches to the site and threatened to camp out on the vacant lot until it was built. In early April 1978, he led a column of 2,000 mostly African-American protesters to the vacant lot in an aggressive demonstration of support. With Nixon gone and Carter in the White House, HUD moved to shut off the funding spigots if Philadelphia didn’t restart construction. The city would eventually lose tens of millions in HUD money as punishment. By 1978, when the Supreme Court refused to even hear the appeal of RAB v. Rizzo, the obstinate mayor and his most loyal constituents had their backs against the wall. Within a year and a half, Rizzo would be out of power. Deprived of political support or legal alternative, the Whitman Council held a vote on the next course of action: 803 voted to secede from the city and 5,138 to “return to the streets.” Only 52 voted to accept federal court orders. Again they appealed for solidarity from construction workers and truck drivers, some of whom refused to deliver goods to the site. When that didn’t work, they tried insults and threats. Black workers told the Philadelphia Bulletin they had been called “n*****s” and “black motherfuckers” on their way to work. White workers described being spat upon and called “white n*****s.” Their names and addresses were read over loudspeakers. Hundreds of protestors ringed the site and dozens sat in at the entrance. This time the cops weren’t so lenient. On June 3, 1980, 63 people were arrested at the site. Then on June 6, Whitman exploded. That night a 70-year-old anti-housing demonstrator, Marian Carr, was shot in the temple and died while soliciting funds to cover legal fees for neighborhood residents arrested during the actions. Her killer, Ralph D’Amico, had fired five shots from his second story window after an altercation with another group of legal fundraisers (one of whom apparently tossed a brick through his window). A riot ensued. Six hundred enraged residents stormed into the streets, and fires were set near the construction site. This time the police did leave their vehicles, and were met with showers of rocks and glass bottles. Again the mob targeted the protective fence, partially tearing it down. Whitman Park opened in October 1982. It seems there were few, if any, incidents to mar the move in. After 25 years of strife, Whitman Park basically just faded into the neighborhood. Meanwhile, Ronald Reagan’s HUD raised the income requirements for the project. Incoming residents had to make between $30,705 and $67,611 in today’s dollars, and not be receiving welfare. The median family income in 1980 in the Census tract containing Whitman was $42,167. According to Lombardo, all of the initial renters were on the lower end of HUD’s scale, in the $30,000 to $35,000 range. Those tenants who completed the lease-purchase period and met the Turnkey III stipulations were able to purchase the homes, and then sell them at market value if they wished. Eventually, all the units were purchased. Today, the neighborhood again contains no public housing. Today many of the people on the stoops and in the driveways of those long-contested row houses are Asian, testament to the influx of Vietnamese and Cambodian immigrants into South Philadelphia. The arrival of young middle-class newcomers and upmarket restaurants that has transformed South Philadelphia neighborhoods closer to Center City has not yet reached Whitman, which isn’t within comfortable walking distance of downtown. There is a larger African-American population now, although the immediately surrounding blocks still appear very white. The larger census tract has gone from 96 percent white in 1970 to 78.6 percent white today; the black population is 7.2 percent and the Asian population 11.9 percent. Economically, the neighborhood has remained remarkably stable, in contrast to most of Philadelphia’s row-home neighborhoods, avoiding dramatic movement up or down market. It is by no means an expensive neighborhood, but Whitman is still unaffordable to those served by traditional public housing. According to Red Fin, the median sales price for a “townhouse” was $121,000 in 2009, and after five years of decline, jumped to $136,500 in 2015. Today the Whitman Council fights to preserve the single-family nature of its housing, holding the line against outside investors and duplexes. After Whitman Park was built, Philadelphia and its Pennsylvania-side suburbs abandoned integration as a policy goal. Instead, policymakers concentrate on getting affordable housing into low-income neighborhoods where it would more likely be appreciated, or at least not so vehemently opposed. Whitman was the last development to be built in the city under the traditional public housing program. During the 1990s, the few high-rise public housing complexes close to the revitalized Center City were demolished under the HOPE VI program. Newer affordable housing programs have resulted in familiar patterns of segregation. During President Barack Obama’s presidency, an attempt was made by the region’s housing authorities to enable Section 8 voucher holders from Philadelphia to locate in more affluent suburban areas, and their substantially better funded school district, but the effort collapsed amid bureaucratic infighting and all the voucher holders either ended up back in the city or in struggling inner-ring suburbs. The lesson of this forgotten battle over public housing in South Philadelphia is that politicians and bureaucracies alone cannot overcome the reactionary resistance of homeowners who learn that lower-income people, often of a different race, may soon be moving in next door. Policymakers cannot be expected to act as crusading superheroes. Without countervailing interest groups to get bodies in the street, voters in the booths, and lawyers in the courtroom, segregation will remain in place. Jake Blumgart is a freelance reporter, researcher, and editor based in Philadelphia whose writing focuses on topics including housing, transit, labor, and urban issues.